Prime Minister Justin Trudeau is blaming the Conservatives for exacerbating the plight of Alison Azer by cutting diplomatic ties with Iran. Azer is fighting to bring her four children back from Iran. Prime Minister Justin Trudeau is blaming the Conservatives for exacerbating the plight of Alison Azer by cutting diplomatic ties with Iran. Azer, whose former husband is wanted by Canadian police for taking their four children to Iran 14 months ago, lashed out at the Liberals yesterday for not doing enough to help bring her kids home. 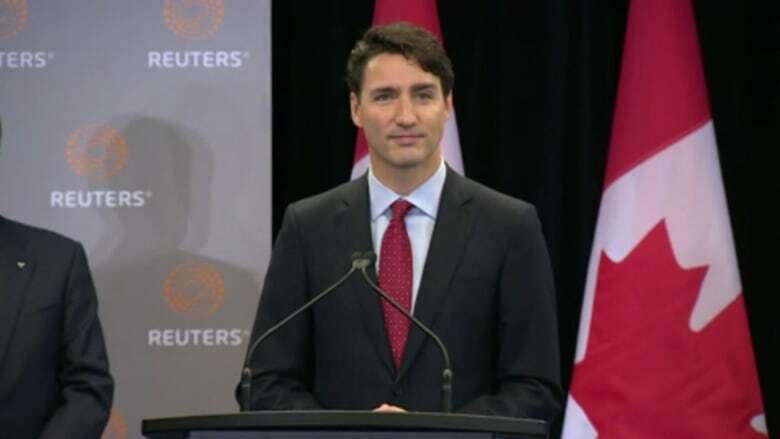 Answering questions about the case during a media availability session in Toronto Friday, Trudeau insisted his government has been working "extremely hard" on the "troubling case" — but said those efforts have been hampered by decisions the former Stephen Harper administration made. "It would be significantly easier to engage in this situation if the previous government hadn't made the decision for political and ideological reasons to close down our representatives in Iran," he said. The Conservatives cut ties with Tehran in 2012 and expelled Iranian diplomats from Canada. Azer was deeply offended Thursday after Foreign Affairs Minister Stéphane Dion made what she called a "disrespectful" gesture while Conservative MP Michael Cooper was asking questions about her case in the House of Commons. While he was speaking, Dion allegedly gave him two thumbs down. The gesture was not captured on camera. "I was truly disappointed to see the foreign minister exhibit such unbecoming behaviour on such an important issue to Canadians," Azer later told reporters. A Canada-wide warrant was issued last August for Saren Azer — a doctor of Kurdish-Iranian descent — after he failed to bring his four children home to his ex-wife in Comox, B.C., after a court-sanctioned trip to Europe. He has defended his decision to take the children to Iran, saying it was in their best interests. Dion didn't deny making the gesture, but said it was intended to take issue with the "cheap shots" Cooper was taking at the prime minister. Asked today if Dion's behaviour was acceptable, Trudeau would say only that people are "emotionally impacted" by the case of Azer and her children. "When we're passionate about helping a family, we're concerned about the level of politics being applied to a situation that we should all very much care about," he said. During Question Period later Friday, Opposition House Leader Candice Bergen demanded Dion apologize for making the "inappropriate and unparliamentary" gesture. "I am sorry that some interpreted it to be directed at Madame Azer. It was obviously not the case," he replied. "I have nothing but compassion for Madame Azer and can not imagine the anguish she must be going through." Dion accused the Opposition of politicizing the situation, which he called unhelpful to the cause.